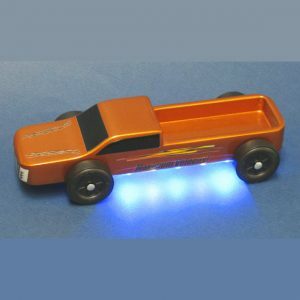 Make your pinewood derby car stand out from the crowd with Underglow Lights! Do you need 25 or more decals to sell or distribute at your group or club? We can offer you a deep discount on bulk sticker decal orders. Contact us for more information. March 3rd, 2019 at 1:00 p.m. Photos must be sent by e-mail in JPG format (minimum size of 640×480, maximum size of 1280 x 960). 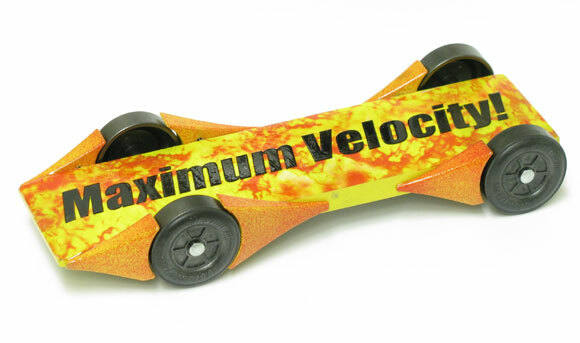 Please shoot photos from the front left of the pinewood derby car, similar to the orientation of this car. Make sure the photo is not blurry. If your photos are blurry, try holding the camera four or five feet away from the car, and then use the camera’s zoom to fill the frame with the car. Also, use a solid (preferably white) background for the photo. Printer paper works well as a background. Send only one photo per car, unless an additional photo is needed to adequately show a feature. 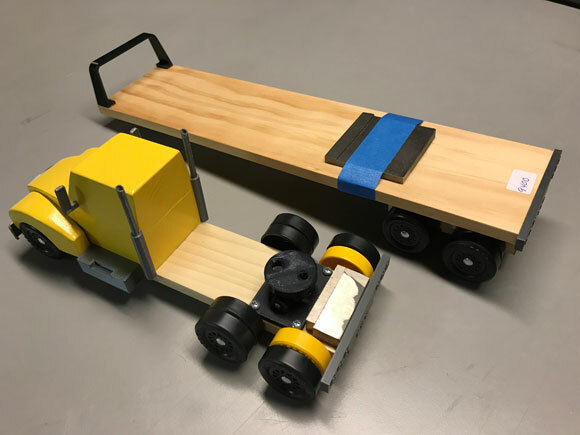 Don’t forget to include your name, the name of the car (if it has one), and a brief write up on any design features, inspiration for the design, and how the car performed at the race. Thanks. We don’t have many remaining, so don’t delay. You can find these items Here. The only thing I’ll say about option 1 is that you pay a lot of money to save yourself one saw cut! But let’s focus on the weight hole options and ask a few questions. Why do some vendors drill three holes and other vendors drill four holes in the side of the car? Why do some vendors drill only side holes, while other vendors (specifically Maximum Velocity) drill holes in the side and in the bottom of the car? The number of holes in the car will determine the types of weight that can be used on the car. Specifically, let’s consider steel, lead, and tungsten. So, if a vendor wishes to support steel weight then they will need four side holes: three for supporting lead, and two for supporting tungsten only. Note that steel weighting will not provide a very aggressive balance point, but it is much cheaper than tungsten, and non-toxic. But for those that do not want visible holes in the side of the car, then the only solution is to drill your own tuning hole in the bottom of the car or attach under-body weight for fine tuning. It seems to me that if you are purchasing a wedge body, you would want the woodworking to be complete, and a method of weight tuning should be available from the vendor. 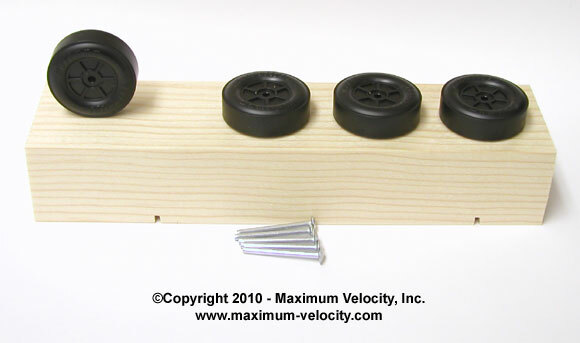 At Maximum Velocity, we decided to provide two side holes to accommodate most of the weight. As previously mentioned, the side holes would be filled with weight, sealed with wood filler, and then painted. The under-body holes are then available for fine tuning. Our standard wheelbase wedge bodies have enough bottom holes to accommodate steel – if you are using lead or tungsten, many of the bottom holes will not be used. On our extended wheelbase wedge bodies, only three bottom holes exist, which are equal in volume to one side hole. Thus, either lead or tungsten can be used for weighting. One concern I have heard many times is that people are afraid that the weight will fall out of bottom holes. Obviously if the wrong glue is used, this could happen. But with the correct glue, the weight will be very secure. I recommend gap filling glues such as epoxy or hot-glue. Avoid water-based glues (white or yellow glue) and avoid superglue. Another concern I have heard is that the bottom hole may detract from the aerodynamics of the car. The aerodynamic effect of open bottom holes is not a measurable factor. However, if it is a concern, then the holes can be filled (use less weight), or a very thin piece of wood or plastic can be glued to the bottom of the car to cover the non-used holes. I know some people use tape to cover open bottom holes or pockets, but I would be concerned that the tape may curl up as the car slides on its belly in the braking section of the track. Whether the wedge body has all side holes or side and bottom holes is a preference issue, not a performance issue. I believe that having bottom holes is more convenient and results in a nicer looking car. But the ultimate decision as to which type of body to use is really up to the car builder. (1) If the car body is not narrowed, then you can get four cylinders per hole, but the sides of the cylinders will be visible. (2) Some people figure out exactly how much weight they will need, taking into account the weight of the wood filler and the paint. They then fill all the side holes with wood filler before painting. This does eliminate exposed side holes, but it assumes that the official scale has the same calibration as the scale of the builder. If the official scale weighs the car heavy, then the car owner must drill into the car, greatly increasing the risk of damage. The unusually rainy winter we have had in Phoenix this year reminded me of a joke some of our Seattle, Washington relatives related a few years ago. It seems a lady moved from Phoenix to Seattle and when she arrived it was raining. While she moved in, it rained. The next day it rained… and the next. Through February 20, 2019, you can get 10 percent off your entire order To take advantage of this limited time offer use coupon code FEB6NL during checkout. Today’s cars (actually Big Rigs) are from Stephen Henry. “These two Big Rigs were entered in the Mid America Derby in 2018. Instead of trying to locate original BSA kits, we made our own and used Maximum Velocity Big Rig Axles with BSA wheels to meet the Mid America rules. The turquoise rig came in third in the B class (straight truck) while the yellow truck won the A class (separate tractor and trailer). 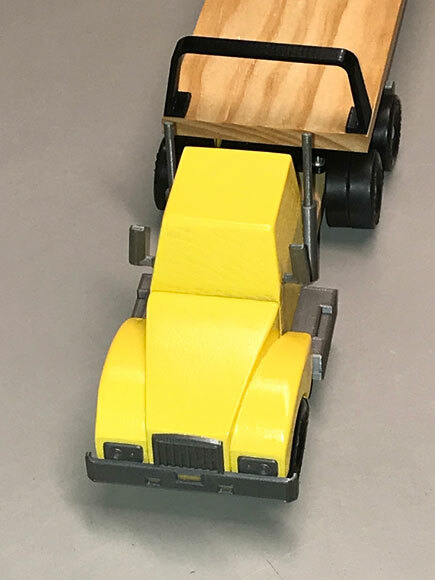 I had just received my first 3D printer a month before the race, so I used it to make the grilles, headlights, bumpers, mirrors, exhaust stacks, fuel tanks, and on the yellow truck, a scaled down fifth wheel hitch. 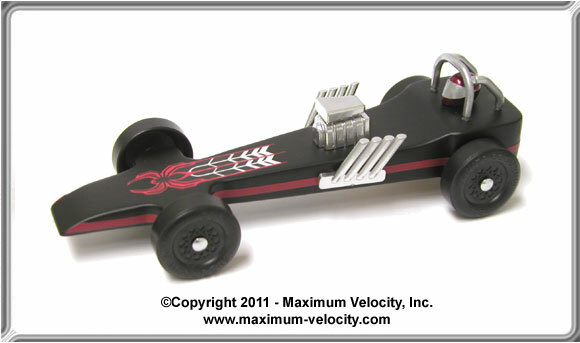 Editor’s Note: Maximum Velocity also offer 18-Wheeler Wheel/Axles Sets. 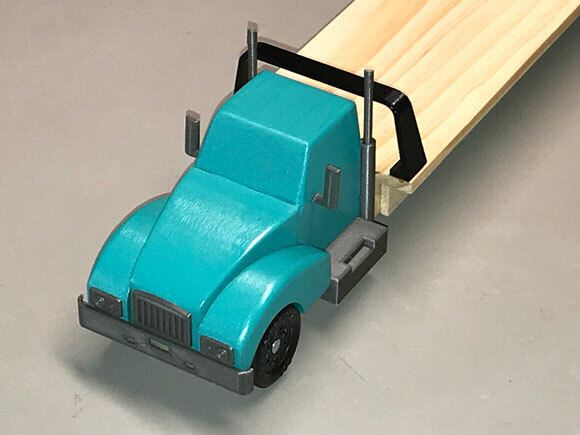 After I read your newsletter that was forwarded to me by a friend, I felt a need to share a special Pinewood Derby moment in my oldest son’s life. When my son was a Webelos II in Pack 169 in Egham, England, our Cubmaster, Glenn Brace, wrote a Pinewood Derby poem that he read prior to our Derby race. I feel the poem says it all. And bless the boys who gather here. Their blocks of wood are blocks no more. Of finishes too close to see! You’re here for every victory. Because his hands tried something new. The splintered car, the sloppy glue. You love the work that Your sons do. Who shows the greatness of Your grace. His are the loudest victory shouts. 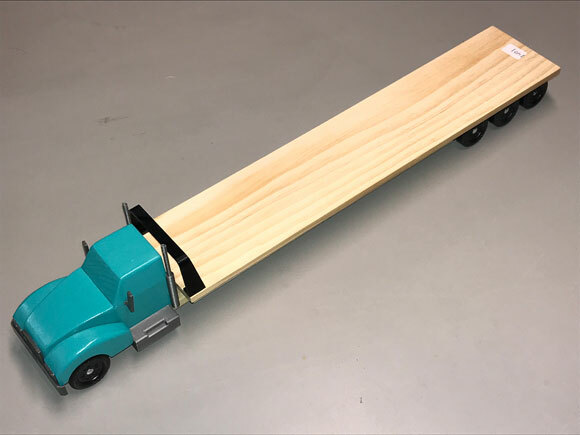 I have a few questions about the 3D printed Pinewood Derby Accel Fenders. (1) Are they legal in scout derbies? (2) Does the car body have to be a certain thickness for these to fit or work? (3) Are the fenders sold as a complete set? (1) Generally, fenders are legal in all races. They are considered an accessory (like a toy driver, exhaust pipes, engines, etc.). As long as accessories are permanently attached, do not cause the car to exceed a dimension or weight limit, and do not impart momentum, they are legal. However, certainly check the rules for your race for any exceptions. (2) The car can be quite thin. I have seen fenders put on ¼ inch thick cars. I have personally used them on a 5/16-inch-thick car. (3) The fenders are sold in pairs: Part 5501 – Front fenders, Part 5502 – Rear fenders. Some people put a set of front fenders in front of the front wheels, a set of rear fenders behind the front wheels, and a set of front (or rear) fenders in front of the rear wheels. You can find the Accel Fenders Here. Does the P370 – PineCar® Basic Car Kit have the option of one-piece axles and nail axles? I thought we ordered these previously and there was an option of either nail axles or one-piece axles but on the description, I’m just seeing nail axles. Over the summer of 2018, PineCar changed the content of P370 to just have the nail axles. The only way to get the long rod axles is to order their wheel/axle replacement sets. I don’t know why they made the change, but I’m sure it will disappoint many people. There are still some kits floating around with the rod axles; it will probably take a year for them to all get sold. I still occasionally get a case in that have the rod axles. 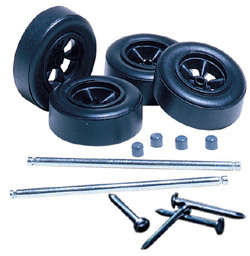 If you are interested in a kit with nicer wheels and at a lower price, you might check out our MV Basic Car kit. Unfortunately, your organizers are out of date. Currently the average raw BSA wheel is 1.182 to 1.186 (not 1.195). So, if they are truly measuring the wheel diameter, anyone that does more than an extremely light sanding will have an out of spec wheel. So, none of our BSA speed wheels will meet this spec (they meet a 1.170 spec). All we offer that would meet your spec are our Premium Matched Wheels, which are raw wheels from one of the better molds, so they will be truer than the average wheel. You might mention to your race organizers that their rules need to be updated. The 1.195 diameter was for wheels made prior to 2009. Since then, they range from 1.182 to 1.186.